A while back I picked up something quite nostalgic, a Klutz Press book for doing Shrinky Dinks. If you don’t know what those are, it’s a clear-ish plastic sheet that you draw on, then cut out shapes, put it in the oven, and watch it shrink down to a much smaller size. A childhood staple for me! 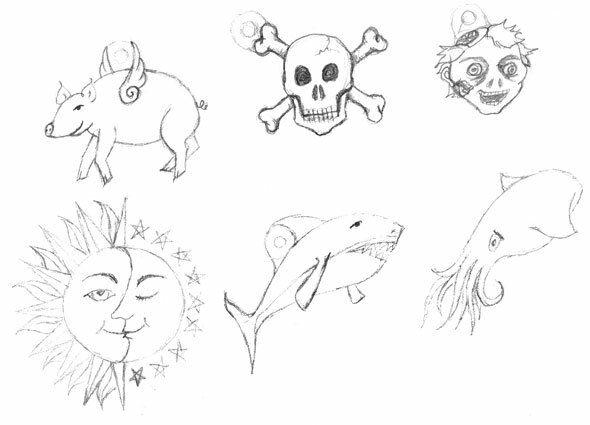 I was thinking of doing up some little charms for Etsy or just for myself, and I doodled up these half-dozen images for tracing with a sharpie onto the plastic. Then I could color them with sharpie or colored pencil, cut them out, and cook them in my little toaster oven. I’m sure I’ll get around to using some of the shrinky dink material someday, if only to amuse myself. And where the heck do you get the material these days? Is it still for sale? Klutz Press sells packs of it (plus some comes in the book), we could always have a Craft Day with it sometime, you know I have all the Sharpie colors a boy could want.